Speed it nothing without control, this doesn't just mean handling but also BRAKING! HAWK performance HPS brake pads will give your Audi S4 B5 just that with increased heat resistance, reduced braking distance, and reduced brake fade! HPS - High Performance Street disc brake pads are world renowned for increasing stopping power on your street legal vehicle. Increasing the performance of your vehicles braking system is easy when you choose Hawk Performance’s HPS braking compound. This unique Ferro-Carbon formula was developed for street performance using the safety and quality of Aerospace and Motorsports severe-duty friction technology. Install brake pads properly. Be sure pads are securely positioned in the caliper. Flush system with fresh brake fluid. Check all hydraulic parts for excess wear and tear. Check disc for proper thickness, parallelism, and lateral runout. Check disc for scoring or grooves over .012”depth. If either applies, resurfacing is required. If discs do not need resurfacing, then contamination from the previous brake pads must be removed. Sand discs with 130 grit sandpaper using moderate pressure. Use soap and water to clean discs’ surface after sanding and machining. Discs should be free and clear of oil, grease, and brake fluid. Inspect calipers for freedom of movement. Lubricate where necessary. After installing new brake pads, make 6 to 10 stops from approximately 40mph - 15mph applying moderate pressure. DO NOT COME TO A COMPLETE STOP DURING THIS PROCEDURE! Make an additional 3 to 4 hard stops from approximately 60mph to 15 mph applying hard pressure, just shy of engaging ABS or locking up. AGAIN DO NOT COME TO A COMPLETE STOP DURING THIS PROCEDURE! Allow 15 minutes for brake system to cool down. After step 4 your new pads are bedded and ready for use. Hawk Performance will warranty products to be free of defects from workmanship and materials. This warranty does not apply to normal wear or damage caused by negligence, lack of maintenance, accident, abnormal operations, or improper installation or service. Hawk Performance does not make any other warranty claims, either expressed or implied, including the implied warranties of merchantability or fitness for a particular purpose. In no event will Hawk Performance be liable for incident or consequential damages of any kind, whether such damages are claimed on account of breach of warranty, breach of contract, negligence, or strict product liability. This includes without limitation, damage to property, or other economic losses that may be incurred. Any, and all, warranty claims must be processed through Hawk Performance. 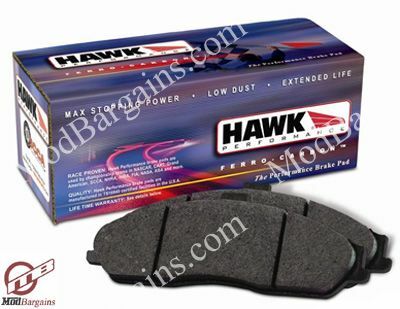 All valid warranty claims will be replaced/reimbursed with Hawk Performance brake pads of equal or greater value.